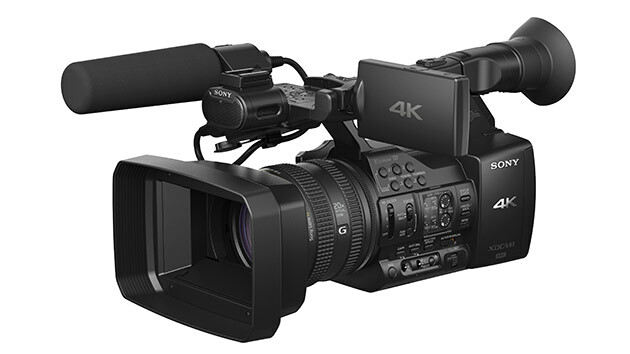 Sony has announced two new 4K cameras, the PXW-Z100 and FDR-AX1. The PXW-Z100 is capable of recording “true 4K” (4096×2160) and UltraHD (3840×2160) at up to 60p, using the XAVC (I-frame) 4:2:2 10-bit codec in the MXF file format – the same codec used by the Sony F5 and F55. Both cameras comes with a fixed 20x Sony G lens, and the Z100 includes a 3G-SDI output. 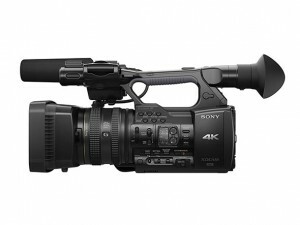 Sony is expanding its line of professional 4K cameras with the new PXW-Z100 4K handheld XDCAM camcorder. With a 1/2.3-inch Exmor® R CMOS sensor, the camcorder can create stunning 4K content (4096×2160) at 50p or 60p. The PXW-Z100 camcorder is based on the same shooting ergonomics as a conventional handheld professional camcorder, allowing users to record 4K content cost effectively. The PXW-Z100 uses Sony’s XAVC™ recording format first employed in Sony’s PMW-F55 CineAlta® 4K camera. MPEG-4 AVC/H.264 compression is used for HD (1920×1080), QFHD (3840×2016) and 4K (4096×2160) content. Image sampling is 4:2:2 10-bit, with an intra-frame system that compresses each frame individually at a maximum bit rate of 500 Mbps or 600 Mbps during 4K 50fps or 60fps recording, respectively, and 223 Mbps during HD 50fps or 60fps recording. are compatible with most 4K TV’s. With more than 8.8 million effective pixels, the 1/2.3-inch sensor captures 4K images at 50p or 60p. The built-in high performance G Lens offers maximum shooting flexibility, including a wide angle of 30 mm in 4096×2160 mode or 31.5mm in 3840×2160 and 1920×1080 modes and 20x powerful optical zoom (equivalent to 35mm). signal. Other features include a 3G HD-SDI interface that supports output to an SDI of up to HD 60p. It also supports HD output during 4K recording. supplied WiFi adaptor into the camcorder to enable the wireless feature. suggested price less than $6,500 (US).